The Scoop: Environmental visionaries designed Babcock Ranch to be a solar-powered, tech-savvy, and family-friendly town that fosters sustainable growth adjacent to thousands of acres of preservation land. Hundreds of couples have chosen to make their home in this master-planned community just north of Fort Myers in Southwest Florida. After over a decade of planning and building, Babcock Ranch offers an impressive model for smart towns built to last. After nearly a decade of planning and construction, Babcock Ranch officially opened to the public in early 2017. The charming, eco-friendly town in Southwest Florida attracted people who were curious about its modern infrastructure and potential for sustainable growth. Families explored the quaint downtown area, extensive nature trails, and budding solar-powered neighborhoods, and many fell in love with the town’s tranquil and energy-smart way of life. 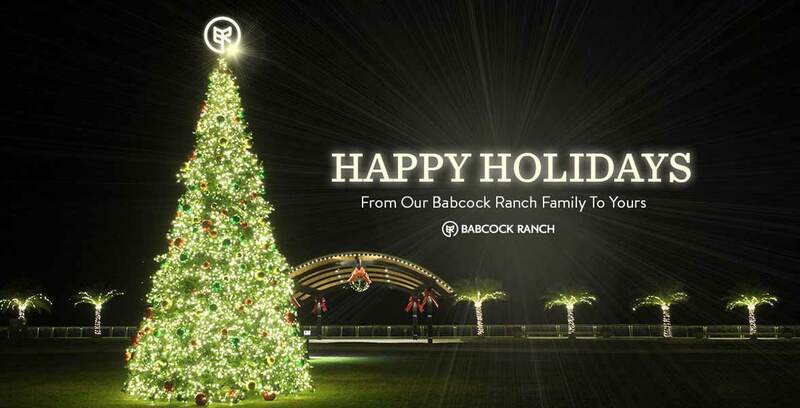 In December 2017, Babcock Ranch hosted a tree lighting event to bring its newfound community together. The event organizers expected a modest turnout because no one actually lived in town yet — the first residents were scheduled to move in a month later. However, dozens of folks showed up to celebrate the holidays with their new neighbors. Carolers sang, children met Santa, and future residents got a glimpse of the friendly atmosphere fostered by Babcock Ranch. The event was such a success that it became an annual tradition. At the 2018 Holiday Event, thousands of people sat out on the lawn eating ice cream and chatting with old and new friends. In the last two years, over 500 people have moved into new homes at Babcock Ranch. Babcock Ranch is a high-tech town focused on making life fun for everyone. The town upholds green standards by investing in solar energy, water efficiency, sustainable local materials, and nature stewardship, and it fosters a vibrant social life by organizing community events, outdoor programs, and educational efforts. Babcock Ranch was designed to be a multi-generational town, so it has a fully functional school as well as recreational activities to educate and entertain a diverse population. Couples who live in this idyllic community can take pride in knowing they’re building toward a better future. Lisa Hall, a spokesperson for Babcock Ranch, said people of all ages can find joy and fulfillment in a warm, welcoming environment. In 1914, Edward Babcock purchased a 91,000-acre plot of land in Southwest Florida to sustain the family’s timber business. The property’s business operations ranged from traditional farming to ostrich breeding. The family maintained the land until Edward’s son Fred died in 1997. He left 42 heirs behind, and Babcock Ranch’s future was uncertain. The Babcock family wanted to honor the land’s beauty and dignity by finding the right stewards for it, but they had trouble negotiating a contract with the government for legal reasons. That’s when environmentally conscious developers stepped in to see what could be done to save Babcock Ranch for future generations. In 2006, a real estate development firm called Kitson & Partners closed the largest preservation land deal in history and sold 73,000 acres to the state of Florida for permanent preservation. Kitson & Partners retained 18,000 acres to build a new town that would incorporate the conservation of natural resources and ecological balance from the ground up. Half of the town’s footprint has been set aside for green spaces. Many environmental organizations rallied around this project to save Babcock Ranch. Leaders in a variety of industries collaborated with one another to build a smart, sustainable community with the potential to grow. After a decade of planning and engineering, the town unveiled its plans on Earth Day 2016, opened to the public in 2017, and it has been expanding ever since. Babcock Ranch has pioneered green technology, including autonomous cars, to support a sustainable lifestyle in Southwest Florida. Babcock Ranch pays homage to its roots as a family-owned property while also ushering in a new wave of sustainable technology to encourage future growth and development. It’s the first fully solar-powered town in the U.S. with over 343,000 solar panels providing over 74 megawatts of energy. This clean energy fuels the town and makes the Sunshine State live up to its name. The walkable town also includes 50 miles of nature trails, autonomous shuttles, and other transportation to encourage residents to stop relying on their cars to get around. All in all, Babcock Ranch’s comprehensive sustainability efforts reflect the environmental principles that led to the area’s development. From the community gardens to the well-maintained nature parks, Babcock Ranch showcases the land’s natural beauty in an ingenious eco-friendly town. 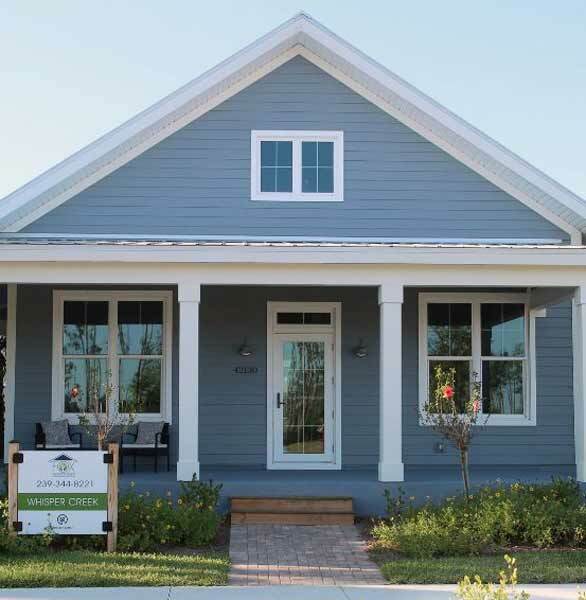 Babcock Ranch offers designer-furnished and move-in-ready houses. The dream homes in Babcock Ranch’s three neighborhoods range in size and price, so they are suitable for couples looking to start a family as well as retirees looking to settle in a quiet Florida town. Model homes are open for viewing every day in the Lake Timber, Parks Edge, and Trails End neighborhoods, and new residents are moving in all the time. The first models in the new Lake Babcock neighborhood will open later this year. The first residents were a couple who moved from Atlanta to retire at Babcock Ranch. Richard and Robin Kinley fell in love with the community because it suited their lifestyle and values. As enthusiastic Babcock Ranch residents and advocates, Richard and Robin frequently attend community events and get to know people who share their interest in living sustainably. The couple joined their earliest neighbors to launch a weekly gathering of Babcock Ranch’s current and future residents to help newcomers settle in and feel part of the community. Within a few months of living in Babcock Ranch, Robin said she had met more of her neighbors than she had living in Atlanta for 20 years. “We’ve seen that people are longing for these relationships and these connections,” Lisa said. From the beginning, the Babcock Ranch planners had a distinct vision for what the community would be. They wanted it to be sustainable. They wanted it to be high-tech. And they wanted it to be a social hub for the region. They wanted to encourage locals to embrace this community and take day trips to visit its nature trails, shopping centers, and other attractions. Founder’s Square is a particularly popular place to mingle with neighbors. This downtown venue hosts live music, produce markets, movie nights, food truck rallies, and health classes. There is always something going on here. You’ll see families, couples, and individuals enjoying the community atmosphere. The downtown area includes a peaceful lakeside boardwalk as well as a buzzing restaurant scene, and it’s well worth a trip to take in the sights. 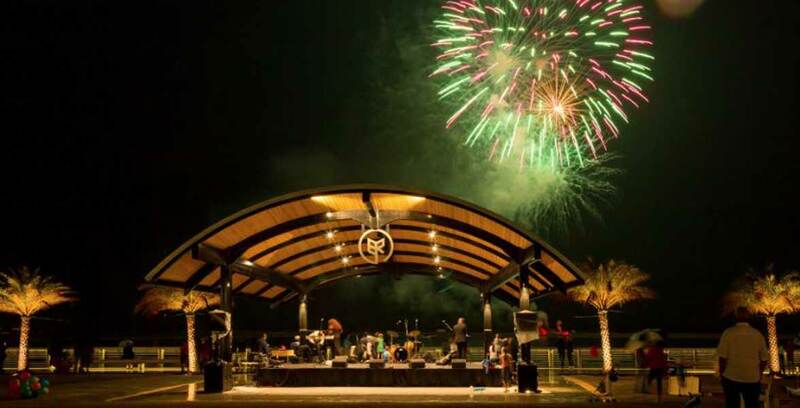 Babcock Ranch hosts festivals and events to help locals get acquainted with one another. In its first year, BNS was the only A-graded elementary school in Charlotte County. As word spreads about its quality education, the school continues to grow more successful. Babcock Ranch is unique for many reasons. This community’s small-town charm is supported by a high-tech infrastructure that includes 440 acres of solar panels. Every detail of the solar-powered town has been carefully designed by environmentally conscious developers, and hundreds of residents now enjoy the fruits of those decade-long labors. Since its grand opening, Babcock Ranch has given people the space to enjoy the outdoors, spend time with friends and family members, and make the world a kinder place. You can see the joyful spirit of this town for yourself by attending a festival in Founder’s Square and chatting with the outgoing residents who have made a life here. Thanks to its updated neighborhoods, Babcock Ranch appeals to individuals who want to reduce their carbon footprint as well as couples who want to get to know their neighbors. It’s all here in Southwest Florida, waiting to be discovered.